Lucy and Edmund are back in Narnia, this time with their dreadful cousin Eustace. They meet up with Prince Caspian, who is taking his ship, the Dawn Treader, on a quest to find his father’s old Lords and friends. Along the way, they’ll have many adventures, and they might even spot Aslan a few times, too. Okay, so I think this series is definitely starting to pull me in. I’ve previously done reviews for The Lion, The Witch, and The Wardrobe, as well as Prince Caspian. So now I’ve just finished Dawn Treader. The Chronicles of Narnia are, all in all, a weird series for me. I keep reading them, and they compel me to do so, but yet I haven’t been SO enthralled with them that I just can’t wait to read the next one. Basically, I’ve been reading the books so that I can watch the movies (even though the books are better), but I keep reading them, so something must be working. 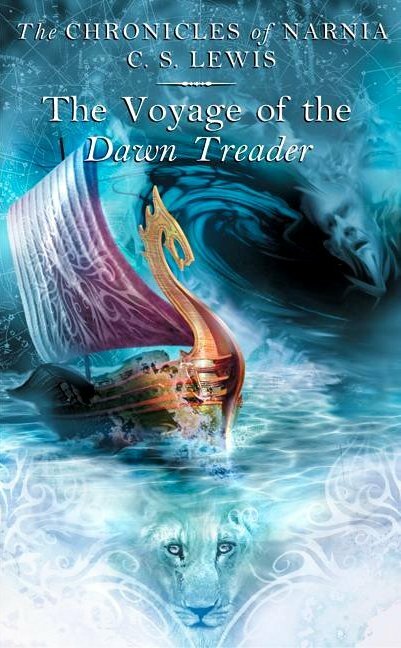 And with Dawn Treader, I felt for the first time that I really liked this series. I think I liked this book because it really reminded me of The Neverending Story, especially the second half when Bastian is in Fantastica. The events of Dawn Treader are all linked by one overarching plot line, but each place they visit is completely different from each other, and their experiences are completely different, too. I also liked how some places had individual adventures for different people, so that it wasn’t the same group experiencing everything. My two favourite parts of this book were probably the man of gold, and Lucy’s glimpses of the underwater world. The man of gold was creepy, and I liked how solemn and spooky this section of the book was. Lots of bad things happen in Narnia, but all in all the feel of the books usually tends to be (to me) fairly cheery, or at least complacent. This scene showed the faults of the characters (with Caspian and Edmund fighting), and gave the whole story a very fairy-tale-esque feel, which I liked. My other favourite scene was the underwater world. I love water and the sea and I like Lucy, so having her experience this fantastic world through such crystal clear water was really cool. I was sad we didn’t get to delve into this underwater world. I wanted more of it! There were two things I didn’t like about this book. One was that Peter and Susan were not in it. I know we are warned this is coming at the end of Prince Caspian, but seriously, what is with the “you’re too old to come here” nonsense?? There are lots of adults in Narnia! Peter was my favourite character, so I missed him in this book. It just wasn’t quite the same without him and Susan. The other thing I didn’t like about this book was the ending, with Aslan suggesting that he is actually Christ/God. Narnia is separate from our world, and I was a little peeved to see religion suddenly thrown in like that. It’s a fantasy, and for many people, religion is a concept that needs escaping from every once and a while. I was not happy to see it thrown into this series, especially right at the end like that. It left a bad taste in my mouth. All in all, I liked this book. I was almost going to give it 4 stars, but the ending really kind of bothered me, so I won’t. Instead, I’ll stick with the same rating I’ve given the other two novels from this series. And again, I’d recommend this book to kids that like fantasy, but only if they’ve previously read the other books in the series.